Can a dead man tell a tale? Early one morning, investigator Gabe Storm is summoned to an apartment by the NYPD. Storm learns his best friend, Scotty Granger, a Broadway producer, is dead. Police suggest Granger died in a botched burglary attempt. Unwilling to accept the NYPD's take on the murder, Storm pursues the illusive killer into the underbelly of Broadway's high finance, the dangerous world of pimps and gangsters and through the halls of the US Senate where he learns how even a dead man cannot keep a secret. I have to admit I'd never even heard of this author but will make it a point to read/listen to his other works. great mystery novel about a movie producer turned PI after being falsely accused of killing his fiancée 12 years before. Gabe Storm starts investigating his friend's murder when he disagrees with police decision to call it a robbery gone wrong. As the list of suspects grows, so does the mystery of the killer's identity. As I was listening to this story, I was reminded of Mickey Spillane's style of writing. I really enjoyed this book and will highly recommend. Roberto Scarlato did an excellent job with narration. This book was provided to me at no cost by the author in return for an unbiased review. I'd never had the pleasure of listening to any of David Wind's 33 previous novels, but when I finished his latest novel, Angels in Mourning, I made a vow to go back and find some books by this author. Angels' immensely likable private investigator protagonist Gabriel Storm had been falsely imprisoned for many years for the murder of his beloved fiancée, stage actress Elaine Hall. While Storm lingers in prison, only two people believe in his innocence, playwright Scotty Granger and police captain Christopher Bolt. Through much steadfast determination, Bolt and Granger eventually win Storm's acquittal. So when Granger is found viciously murdered in what was clearly a crime of passion, Storm is on a mission to find and bring his murderer to justice. Of course, the more Storm investigates Granger's network, the more he realises that many people could have wanted him dead. I thought I had the case solved by midway through the book, but in reality I'd taken Wind's subtle bait and was way off track. I will admit I'm a bit of a literature snob, but Wind's narrative not only left my intelligence intact, he did a magnificent job of drawing me into Storm's pleasantly-seedy New York. The Westside diner was slow...a throwback from the forties. You know the type, all chrome and vinyl with a checkerboard black and white floor. Old and faded pictures of New York lined the walls. It was a cholesterol heaven of pies, muffins, and greasy donuts heaped in scratched plastic covered trays on the counter. Five big chrome coffee urns, like missile silos, were lined against one wall. A rectangular cut-out separated the dining room from the kitchen. Every sound made in the kitchen reached the eating area. I was given this audio book free of charge for an honest and unbiased review. A good story with strong characters and a surprise ending. The narration was decent. A nice listen. What did you love best about Angels in Mourning? Have you listened to any of Roberto Scarlato’s other performances before? How does this one compare? Well Worth your time & Credit !! Thoroughly enjoyed this book. From start to finish. This is my 5th book by David Wind covering three different genres Historical, Epic Fantasy and Mystery/Thriller each and every single one of them have been great stories. Well written, engaging, interesting and entertaining. You are sucked into the story immediately and all you can do is hold on for the ride. It's a mystery within a mystery. One new and one from the past. While I was able to solve part of the mystery before the end, there was still a part that I did not see coming at all. Great characters with a great plot. Bottom line this book is worth your time and credit. I really liked the old time detective feel of the story. I really like all the minute details that are included in the descriptions of each place in the story. It gives you the chance to visualize the scene in your mind. Describes what it's like to drive in south Florida perfectly. The speed limit is basically just a suggestion. Dream sequences are awkward especially in the beginning there needs to be an some indication it's a dream( I stopped my iPod and rewound to make sure I hadn't missed something). Tone of the recording changes from chapter to chapter in the beginning. Sounds hollow sometimes, I didn’t notice it after the first few chapters. Roberto Scarloto does a great job with the narration. Nice voice, very easy to listen to for hours on end. Smooth even pace. Perfect voice for the main character. His female voices were fantastic. Many male narrators cannot do female voices at all, that is not the case here. All around very enjoyable. Anyone familiar with the genre would appreciate the overall feel of Angels in Mourning. David Wind gives good gumshoe. Two stories unfold here. One set in the now and the other nearly a decade in the past. I was confused by this at first and had to go back and start over. (multi-tasking while listening is sometimes a bad idea). Mr. Wind seems also to understand theatre and its jargon. He is less good at choosing his narrators. Or this one anyway. Mr. Scarlato has a lovely, resonant voice, but his lack of prep is too glaring to let slide. Mispronunciations of words and names can happen, but there were just too many of them. "Theeder" is just one. Unfortunately, it was pretty much a theme of the book, so we hear it a lot. fordHAM university. Really? Find a better proofer, Mr. Scarlato. My biggest issue with the narration was the lack of connection with the text. For the most part, it was just words. As if the narrator were reading the book for the first time as he recorded it. I enjoyed the story, but I think Angels in Mourning deserves better treatment. It was not badly written, just smothered in detail with little action, far apart and no suspense. I enjoy detail, but including everything someone ate "I watched the coffee filtering into the pot" It just kills the suspense, and does nothing to ad to the character or the story. I have to say I stopped listening after chapter 31, maybe it picked up after that. Has Angels in Mourning turned you off from other books in this genre? Sorry but yes, maybe I'm not a detective novel reader. I found it painfully slow and boring. It felt like a old time black and white movie, building atmosphere with no suspend or real action. Wish he listened to Chris earlier: "Stop talking and do what needs to be done"
What character would you cut from Angels in Mourning? I did not get to care for any of them. I don't see a theater producer as a detective, the personalities don't blend. This is probably how real life detecting goes. But it does not make it interesting enough to listen to. "This audiobook was provided by the author, narrator, or publisher at no cost in exchange for an unbiased review courtesy of AudiobookBoom dot com." A story of murder, corruption, intrigue and suspense. 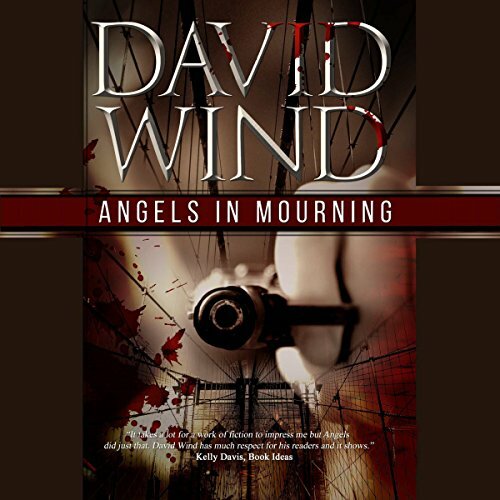 Angels in Mourning is the first novel I have listened too by author David Wind despite Mr Wind having 32 other novels out already. This is because crime/detective books wouldn't normally be my kind of books as I can normally tell early on who the murderer is, but the story sounded too intriguing and good to pass up the opportunity.I'm so glad I did give it a chance as it's opened me up to another author and I define will check out more of his work. This is a story of murder, corruption at the highest level, intrigue and suspense as Gabriel Storm gathers information piece by piece inorder to undercover who the person is who killed his friend Scotty Granger. Along the way he discovers that the story and people's motives are complex and goes beyond Scotty Granger and his Broadway production. At one stage I had accused everyone of the murder of Scotty Granger as they crossed Gabriel Storms path but as the story unfolded I ruled people out one by one before second guessing myself and accusing them again.I started to dream of all the other possible directions that the story could take once something vital had happened but as the story unfolds you discover that the possibilities are endless! I must admit I did have my suspicions on who the killer is halfway through the audio and even though I was right I never anticipated the twist that went with it at the end. Wow! The narration was flawless and Roberto Scarlato does an amazing job of keeping you hooked into the story with his pleasant, easy listening voice that brings the book to life. The characters have their own distinct voices that Mr Scarlato acts out brilliantly. I would recommend listening to Angels In Mourning but be warned you won't be able to think of anything else until you've discovered who the murderer is. Enjoy!